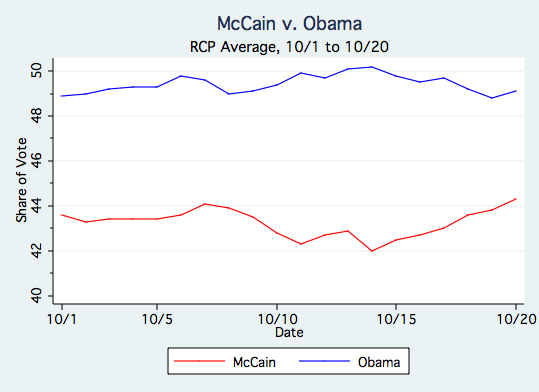 The current Real Clear Politics national average gives Barack Obama a 5.2-point lead over John McCain. This makes a comeback for McCain quite difficult, but not inconceivable. The election of 2000 provides a good reminder of this fact. Like 2008, that was a year in which there was no incumbent on the ballot. Political observers were treated to some wild swings in the polling, right up to the very end. The following graph makes this clear by charting a daily average of nonpartisan polls up to November 6th. It also includes the final results from Election Day. 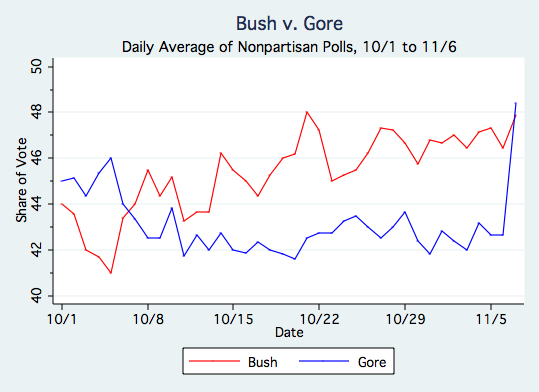 By this metric, Gore was down by 5.5 points on October 21st. Even as late as November 5th, he trailed by 4.7 points. However, Gore finished well. Though he was as low as 42% in late October, he pulled in an extra 6.5% of the vote in the last week to sprint ahead of Bush by Election Day. Meanwhile, Bush's final share of the vote was only a point or so higher than what he polled in the final week of the campaign. We should not expect the 2008 election to evolve like the 2000 contest. Presidential elections are all unique, and each plays out in its own peculiar way. For starters, that DUI story was certainly no help to Bush. Another big difference between 2008 and 2000 is the Nader factor. Nader was polling about 4% of the vote prior to Election Day, and he ultimately won 2.7%. That's an indication that, at the last minute, some of the Nader voters switched to Gore, thus enhancing his rally. So, to win the popular vote, McCain would have to surge better than Gore did. That would be no small feat. Instead of being a strict parallel, the election of 2000 offers two lessons. First, October can be a volatile month, as up to 30% of the electorate is making its final choice. Where you are on October 20th could be quite different than where you are on October 31st. Second, Obama must focus on "closing the deal." That is, he must keep his soft supporters on his side, and convince enough of the remaining undecideds to go for him. The above graph shows that Bush failed to do this eight years ago. What appeared to be a solid win for the Texas governor ended up as a kind of technical victory. Obama had a very hard time closing the deal in the primaries. Fresh off his win in the Iowa caucus, he headed into the New Hampshire primary with an 8-point lead in the RCP average. Yet Hillary Clinton won by 3 points. Either all the polls were wrong, or there was a big shift to Clinton just before the primary. My bet is the latter. Obama, of course, rebounded from his New Hampshire loss - and held his own on Super Tuesday. He then went on a fantastic run for the rest of February, winning the caucuses in Louisiana, Nebraska, Washington, Maine, and Hawaii. He crushed Clinton in the DC, Maryland, and Virginia primaries on February 12th. He followed that up with a big win in Wisconsin a week later. Clinton's back was up against the wall heading into the Texas and Ohio primaries on March 4th. It seemed like it was over. Undecided Democrats would see Obama as the one bound to win, and they'd rally behind him. In a word, it seemed like Obama would finally pick up some momentum. It didn't play out that way. Clinton held Texas and won a decisive victory in Ohio. Despite Obama's delegate lead, and word from pundits everywhere that the race was over, he never developed any momentum. Even after his surprisingly large win in North Carolina on May 6th, Clinton won decisive victories in West Virginia, Kentucky, and Puerto Rico. On June 3rd, when everybody knew it was over, South Dakota favored Clinton over Obama by 10 points. In fact, during the three final months of the primaries, Hillary beat him 52-48. Obama never scored a knockout against her. Instead, he won the nomination by lining up the party establishment and securing oversized victories in the caucuses, for which the Clinton campaign was unprepared. Obama's weak finish in the primaries serves as the subtext for these next two weeks. Republicans are wondering if voters will again have second thoughts about him now that he's the clear frontrunner. Meanwhile, the Obama-Biden campaign is clearly taking no chances. Here in Western Pennsylvania, as in most swing states, Obama is virtually omnipresent on television. That's the mark of a campaign that learned a tough lesson in the primaries: there will be no coasting to victory. Many of the Obama advertisements running here are actually autobiographical, taking snippets from his convention biographical video and repackaging them in 30-second spots, with a distinct emphasis on his American roots. That's not what we should expect so late in the cycle - but Obama is no typical candidate. The point of such ads is to make voters feel comfortable with the idea of him as President. I think this ultimately kept him from landing that knockout blow against Hillary. Those late-breaking primary voters felt more at ease with Hillary instead of Obama. That's what Obama wants to avoid next month. Obama's advertising edge might be moving numbers in individual states, but his national number has stayed pretty constant in the last few weeks. Here's a track of the RCP average from October 1st through today. As we can see, Obama's numbers have been been stable between 48.8% and 50.2% this month, with an average of 49.4%. McCain's numbers have been more variable, ranging between 42% and 44.3%. Obama jumped out to a 6-, 7-, even 8-point lead not because his support base was growing. Instead, McCain's was shrinking - though it appears to be coming back a bit. Meanwhile, the undecided share of the electorate seems to have been pretty constant at about 7% of all voters. There are plenty of reasons to expect these people to decide late, regardless of how intense the electioneering becomes. So, even if Obama's ad blitz has not moved these people yet - it could eventually move them. And again, it might be moving undecideds in some states. If Obama's job between now and November 4th is to make these remaining undecideds comfortable with the idea of him as President - McCain must make them feel uncomfortable, casting himself as a safe alternative. How will he do that? It won't be via Jeremiah Wright. McCain has ruled that out. [Update: Maybe not?] He might continue to push William Ayers or others from Obama's Chicago past, but I doubt they will be front-and-center. We're hearing the "s word" - socialist - from McCain surrogates these days, and that will probably continue to be a refrain his campaign sings. My hunch is that McCain's closing argument will focus on Obama's relative inexperience. There are three reasons to think this. First, this attack seemed to work for Hillary in late February. When Obama was poised to win the nomination, she released that "3 AM" ad, which many took to be quite effective. Second, unlike Wright and Ayers, it is not in the least bit radioactive, so there is little risk of backlash. Third, it's Obama's principal weakness. By conventional metrics, Obama is to be counted as one of the least "credentialed" nominees we have had in a long time, ranking with Thomas Dewey and William Jennings Bryan. Remember this web ad? McCain dropped it during Obama's convention, but then it disappeared from view. My guess is we'll see more stuff like this before November 4th - especially the last segment where Obama talks about whether he would run in 2008.